With US mid-term elections coming up, expatriate Americans need to be aware of their rights and how to go about voting. GENEVA An American friend recently recounted how his parents, after many years of living in Switzerland, were surprised to learn that they still had the right to vote in US federal elections. In fact, every American citizen, 18 and over living outside of the United States has the right to vote. And with the onset of mid-term elections that may be decisive in the balance of power in Washington, D.C. for years to come, exercising that right, this year, is as important as ever. 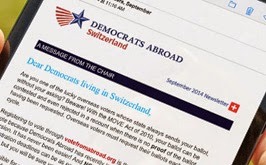 Democrats Abroad is working hard to encourage US citizens resident in Switzerland to “go out and vote”. Tom Fina, Democrats Abroad Executive Director Emeritus, 28 September 2014. His letters are insightful and worth the time to read. Ken Burns' just finished fourteen hour PBS documentary on the Roosevelts (Theodore, Franklin and Eleanor), taken with the looming struggle to replace Attorney General Eric Holder, reminds us that achieving Lincoln's vision of government “ of the people, by the people and for the people” is an enduring battle now led by Obama. His appointment of the first black to be Attorney General followed the pushing of the envelope when TR appointed the first Jew to the cabinet and FDR appointed the first woman. There are those who have never forgiven them. Vote in the November 4 midterm election that will determine control of the House and Senate by requesting an absentee ballot. 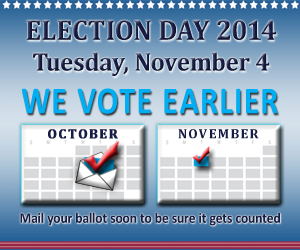 ❷ Vote as soon as you receive your ballot to avoid losing it, forgetting about it, or missing the deadline. ❸ You must mail your ballot back to your local elections office. Swiss Post International Priority mail is reliable and requires approximately 3 to 7 days for delivery to the States. ❹ Your completed ballot must be physically in the possession of your local elections office by the deadline—a postmark on that date will not suffice. ❺ If you have not received a ballot at least 30 days before the election, vote using the Federal Write-In Absentee Ballot (FWAB) by mailing it to your local elections office. ❻ Each state has its own rules and procedures, so review the guidelines applicable to you. Here's a handy overview of request deadlines and ballot due dates. Demorcats Abroad is targeting 11 Senate races in which our votes from Switzerland could be critical in determining these very close contests. Demorcats Abroad is targeting 24 House races in which our votes from Switzerland could help remove the obstructionsts blocking progress. Day two of our voter registration event outside the cafeteria on the univeristy campus. Webster students and outside community are invited to attend. Where : Webster University, Route de Collex 15, 1293 Bellevue – a 2-minute walk from the Genthod-Bellevue train station. Candidates will speak on key issues, their current Senate campaigns, and answer select questions submitted in advance. Now through October, all around Switzerland: Join phone banks, participate at voter-outreach tables, tell us about places or event that are popular with Americans, host a GOTV event. Volunteer activities are fun and a great way to meet like-minded Americans. There are lots of ways to help and we will provide you with training. Hosted by the American International Club. Join us for a delicious family get-together! This year’s profits will be donated to La Maison Tara hospice. © 2014 Democrats Abroad Switzerland.